White paper on crime 2004 Part1/Chapter1/Section1/4. This subsection reviews the trend of penal code offenses that attract public attention particularly. Table 1-1-1-12 shows the number of cleared cases for homicide for insurance money over the last10years.The numbers since1999were larger than those before1998. Table 1-1-1-13 shows the numbers of reported cases and cleared cases for random killings(killing or causing injuries to unspecified people at random without clear motivation,at a place accessible to anyone often with the use of weapon)over the last10years. Table 1-1-1-14 shows the numbers of reported cases and cleared cases,and clearance rate for abduction/kidnapping over the last10years.Although their clearance rate was81.3%in2003,higher than that for other offenses,it has been on the decline in recent years. Table 1-1-1-14 and  shows the numbers of reported cases and cleared cases,and clearance rate for malicious abduction/kidnapping cases,i.e.those for ransom or those targeting children under13years of age,over the last10years.In2003,reported abduction/kidnapping targeting children under13years of age was133,accounting for46.8%of total abduction/kidnapping.Reported abduction/kidnapping for ransom,which had been less than10until1998,has been10or more since1999.Clearance rate has remained at an extremely high level for adduction/kidnapping for ransom. 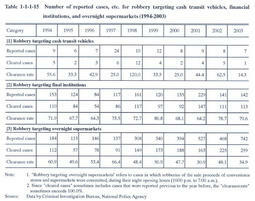 Table 1-1-1-15 shows the numbers of reported cases and cleared cases,and clearance rate for robbery targeting cash transit vehicles and financial institutions,and overnight robbery targeting convenience stores and supermarkets over the last10years.Reported robberies targeting cash transit vehicles have been on a par at around10except in1997.Reported robberies targeting overnight supermarkets have been over300since1998,and increased remarkably from the previous year to742in2003. Table 1-1-1-16 shows the numbers of reported cases and cleared cases,and clearance rate for card offenses committed by misusing credit cards,cash cards,and consumer loan cards,etc.,over the last10years. Examining the3,213cleared card offenses in2003,2,027cases(63.1%)involved cards stolen or picked up on the street,629cases(19.6%)involved counterfeit cards,and557cases(17.3%)involved other cards.Cases that involved counterfeit cards decreased by140from the previous year(Source:Data by Criminal Investigation Bureau,National Police Agency). A common modus operandi of card offenses is to illegally obtain orskim"electromagnetic data in cards with the use of electronic devices,make counterfeit cards,and then misuse them.In light of this, an offense relating to electromagnetic records in payment cards was newly established upon the partial amendment to the Penal Code in June2001(entry into force in July2001).This amendment was intended to impose heavier punishments for illegal production/use of electromagnetic records in payment cards and deposit/savings withdrawal cards,and also to make punishable the acts of assigning,lending,importing,or possessing a card containing illegally produced electromagnetic records as well as the act of illegally obtaining electromagnetic information contained in cards.In2003,reported offenses involving electromagnetic records in payment cards increased from287in the previous year to515,cleared cases increased from277to459,and cleared persons increased from148to237. (Source:Criminal Statistics by National Police Agency). Recently,telephone fraud cases known as ore ore sagi have increased rapidly.Ore ore sagi is a telephone fraud case in which perpetrators call up their victims pretending to be a family member such as a son of the victim,and ask for money for compensation to settle a fictitious traffic accident be placed immediately in a designated bank account.In2003,reported ore ore sagi cases were6,504,which include4,319accomplished cases and2,185attempted cases. Table 1-1-1-17 shows their reported cases by month.They have increased rapidly since mid-2003. By type of modus operandi to deceive victims,cases requesting money for compensation to settle a traffic accident were the most common with4,035,followed by those for the payment of debts such as consumer loans with1,268,and those to undergo an abortion with367.The total amount of damage of ore ore sagi amounted to4,318,268,642yen. In2003,cleared cases for ore ore sagi were179,and cleared persons were58including six juveniles. (Source:Data by Criminal Investigation Bureau,National Police Agency). The Law Concerning the Prevention of Child Abuse(Law No.82of2000)is enforced in relation to child abuse.Though not having the special provisions on punishments for crimes related to child abuse,the Law clearly mentions that no person shall be permitted to abuse a child,and a person who commits such an offense should not be immune to punishment on the ground that he/she is a person having parental power.Partial amendments were made to the Law in April2004(entry into force in October2004)to stipulate that child abuse is a human rights violation against children and to clarify the definition of child abuse. Table 1-1-1-18 shows the number of cases and persons cleared for child abuse,by type of offense.In2003,157cases and183persons were cleared. 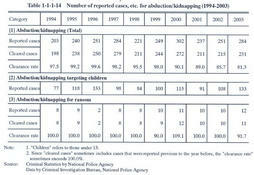 Table 1-1-1-19 shows a breakdown of the183persons cleared for child abuse in2003,by the relationship between perpetrator and victim.Among all persons cleared,119persons were fathers,etc.,accounting for more than60%of the total.On the other hand,among those cleared for homicide and abandonment(by a person responsible for protection of the victim),mothers,etc.accounted for a larger share than fathers,etc.,and biological mothers accounted for a larger share than biological fathers. Under the Law For Punishment of Organized Crime,Control of Crime Proceeds and Other Matters,a person who commits specific penal code offenses such as homicide shall be subject to an augmented punishment in the case where(i)the offense is committed as a group activity by an organization that is intended for such activity or(ii)the offense is committed for the purpose of enabling the group to obtain illegal interests.The Law also punishes acts of money laundering,such as disguising or concealing crime proceeds,under certain conditions,and stipulates procedures for depriving offenders of crime proceeds.The Law entered into force in February2000. Table 1-1-1-20 shows the number of persons newly received by public prosecutors offices for violation of the law. Penal code offense: Penal code offenses include(1)offenses prescribed by the Penal Code and(2)offenses that are prescribed by other laws but have common characteristics with those prescribed by the Penal Code. For instance,the Law Concerning the Prevention and Punishment of Burglary,Robbery,Theft,etc.imposes a heavier punishment for theft that satisfies certain requirements as habitual recidivist theft,which shares characteristics with theft under the Penal Code and therefore is included in the category of penal code offense. For the precise scope of penal code offenses,see Notes. Special law offense: Special law offenses refer to offenses other than penal code offenses,such as violation of the Road Traffic Law and violation of the Stimulant Control Law. Non-traffic penal code offense: Non-traffic penal code offenses refer to penal code offenses excluding professional negligence in traffic accidents. Professional negligence in traffic accident: A person who by negligence has killed or injured another in a traffic accident shall be charged for professional negligence resulting in death or injury or gross negligence resulting in death or injury under Article211of the Penal Code.The offense in such case is referred to as professional negligence in traffic accidents.As professional negligence in traffic accidents is committed by negligence and its influence on public security is different from that of homicide and theft,the White Paper on Crime deals with professional negligence in traffic accidents separately from non-traffic penal code offenses in the category of penal code offenses for analysis,if necessary.Unsafe driving resulting in death or injury(Article208-2of the Penal Code),which was newly established upon the legal amendment in2001,is included in non-traffic penal code offenses rather than professional negligence in traffic accidents. For the precise scope of professional negligence in traffic accidents,see Notes. Number of reported cases: Number of cases that are reported to the police or other investigation authorities. Crime rate: Number of reported cases per100,000persons. Number of cleared cases: Number of cases that are cleared by the police or other investigation authorities,including cases that are referred to public prosecutors offices or disposed as minor offenses. Clearance rate: Rate of number of cleared cases in the number of reported cases. Number of persons cleared: Number of suspects cleared by the police,etc.